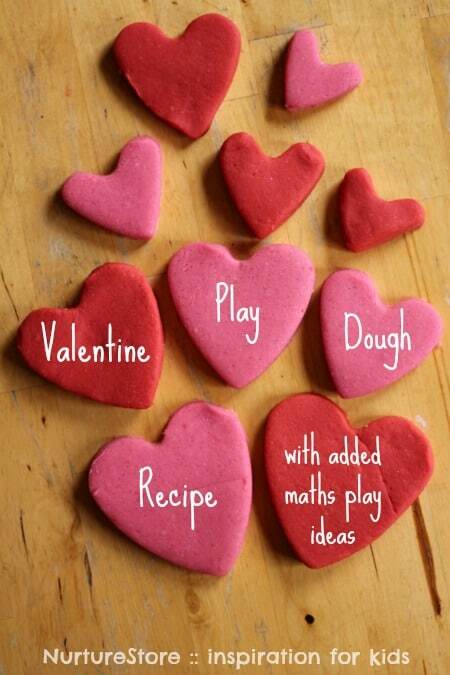 Here’s a really simple, no cook Valentine play dough recipe, along with some maths play ideas. If you’ve never made homemade dough before, give it a try! 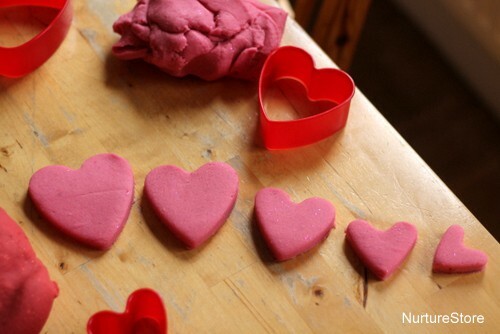 I’m using my favourite no-cook play dough recipe, which is the one I use pretty much all the time we make play dough. We can ring the changes with different colours, scents and added extras, but I like to keep things simple by sticking with a tried and tested recipe. It only takes a few minutes to make in a bowl, with no cooking needed. We’re mixing 2 cups of plain (all purpose four), 1 cup salt, 2 tablespoons of cream of tartar, 2 tablespoons of vegetable oil. Add your colouring (see below) and then pour on one and half cups of just boiled water and stir to form a dough. 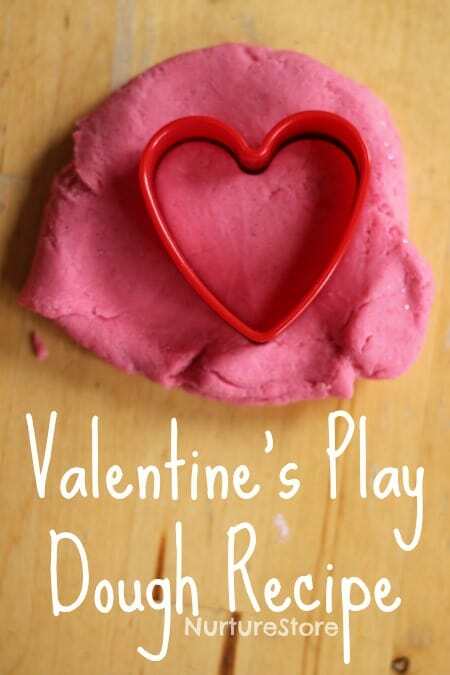 You can find the Valentine play dough recipe card here – print it and pop it on the fridge door, and use it with your children to read and count out the ingredients. I’ve tried lots of different ways to add colour over the years, including different brands of food colouring and paints, but my current favourite is Wilton Icing Colour Gels (affiliate link – NurtureStore gets commission for purchases via this link.) They give a great colour, don’t affect the consistency of the play dough, and you only need a little tiny bit of gel to get a great shade, so they last for ages. 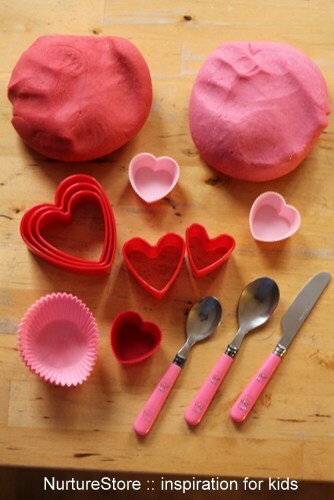 I made two batches of the play dough recipe and added red colour gel to one bowl, pink to another. Plus some glitter for added sparkle! You can set out an interesting invitation for play simply by raiding the kitchen cupboards. Cookie cutters and cake cases in different sizes, along with some cutlery, give you a great springboard for imaginative play. 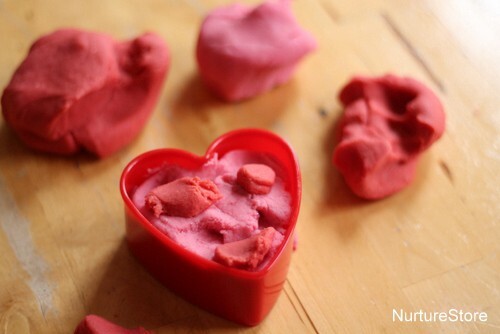 Playing with play dough is really good for fine motor skills. As children knead, pinch, roll and squish the dough, they are building up strength and flexibility in their hands and fingers. This helps when they work on transferring these skills into holding a pencil, writing, fastening buttons, tying up shoes laces…. Give lots of time for pretend play, and see how your children use their imagination, tell stories and use their language as they play. You can also build in some playful maths. 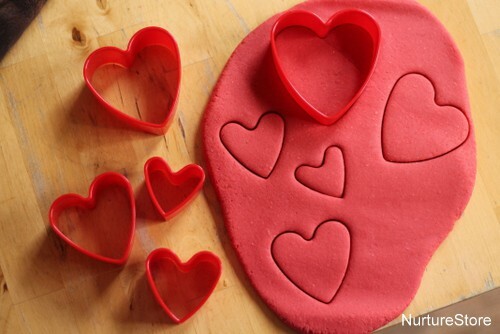 Using your cookie cutters, you can stamp out heart or circles in all different sizes. You can count them, and see if your child can order a set of them by size, making a row from biggest to smallest. Or see if you can make a repeating pattern of one big heart, one small, one big heart, one small…. This is a great salt dough recipe! Love that it’s no cook. 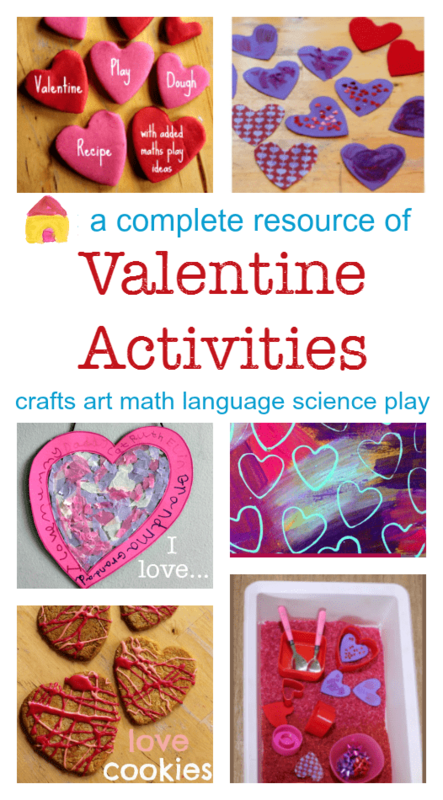 We are using it for a Valentine’s party for pre-schoolers. Thanks!